THE EVER-INCREASING complexity of healthcare is driving the need for coding quality and compliance programs. 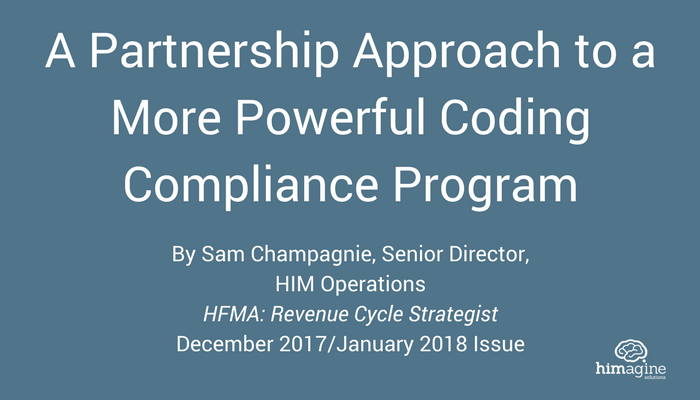 Given the transition to ICD-10, advancements in treatments and procedures, a move to quality reporting, and evolving regulations with potentially lofty penalties, the lost reimbursement at stake as the result of poor coding is driving more providers to intensify their coding audit programs. The trend among large providers is a wave of both random and targeted audits at varying stages of the revenue cycle—from pre-bill to post-bill analysis of key issues ranging from denials to specifics such as transfer DRGs. Data analytics has moved from IT and finance to the majority of business functions—including clinical coding. Is your organization leveraging analytics? Check out this month's HIM Scene guest blog, authored by Julia Hammerman, Director of Education and Compliance at himagine. Julia's blog explores the importance of analyzing clinical coding data to improve quality, productivity, and compliance.